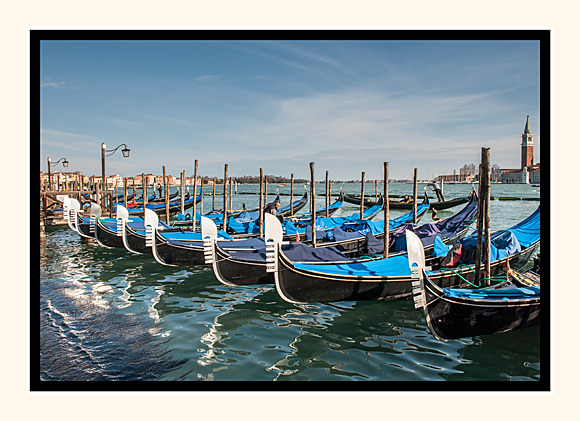 With the Gondolas at their moorings you can see perfectly their representation of Venice. The Prow-Head of the gondola is called "fero da prora" or "dol fin" and is needed to balance the weight of the gondolier. The prow-head has a comb of six teeth or prongs under the main blade, which represents the six districts of Venice. you can see between the six teeth, three Friezes pairing the teeth (districts) indicating the three main bridges of the city. The Rialto Bridge, The Ponte dell' Accademia, and the Ponte degli Scalzi. The prong that juts backwards towards the centre of the gondola represents the Island of Giudecca. The stern of the gondola has an "S" shape symbol of the twists in the Canal Grande.